Teacher of the Year finalist Yvonne Logan, Charles Riley and Michael Gelbman pose with Logan's kindergarten students. 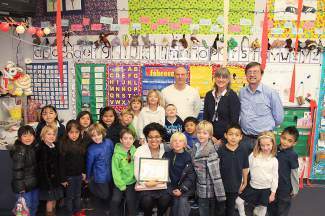 TAHOE/TRUCKEE, Calif. — Kings Beach Elementary teacher Yvonne Logan has been selected as the second Truckee Hometown SEARS-Sierra Sun/Bonanza Teacher of the Year finalist for the 2013-2014 school year. Logan teaches transitional kindergarten in the two-way immersion program at Kings Beach Elementary. Teaching in both English and Spanish, Logan works to ensure students have a strong foundation in both languages. Parent nominators praised Logan for her ability to reach students regardless of their background language. “She is incredible at teaching non-Spanish speakers from day one, by using lots of animated speaking, descriptive terms, and by teaching the kids tricks to remember things in Spanish,” wrote one parent nominator. Kings Beach Elementary principal Eileen Fahrner praised Logan for being an amazing teacher. 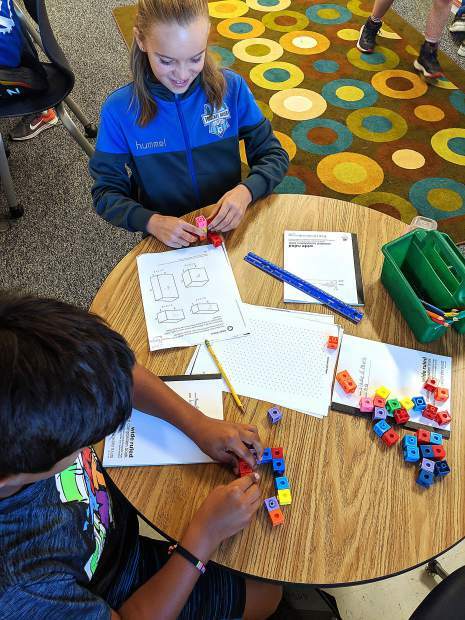 “She is extremely creative in her lessons: they are highly engaging for the students and help them learn important skills necessary for success,” said Fahrner. On Feb. 24 Charles Riley, owner of Truckee Hometown SEARS and Michael Gelbman, publisher of the Sierra Sun/Bonanza presented Logan with a finalist award certificate and gifts from program sponsors. Yvonne Logan decided to became a teacher when she was in fourth grade. Logan’s teacher at the time, LouAnn Williamson made her third and fourth-grade school years engaging and challenging. On the last day of school, Logan cried and asked who would be there to challenge them now? Williamson told her it was time for the students to start challenging themselves. Logan took this advice to heart and decided she wanted to inspire children someday as a teacher herself. Logan received a bachelor’s degree from the University of California Berkeley and went on to earn her bilingual teaching credential at University of California Davis. Logan remembered struggling to communicate as she learned English in kindergarten, and wanted to use her language skills to help other children. In 1997, after teaching one year in the Sacramento area, Logan learned about Kings Beach Elementary, from then principal Bill Ellison. Excited to work as a bilingual teacher, and be a part of the future two-way immersion program, Logan moved to the Tahoe area. She has been teaching at Kings Beach Elementary ever since. She taught first, fourth, fifth grade and kindergarten, and has spent the past two years teaching transitional Kindergarten. Logan enjoys working with young students and watching them blossom into confident kindergarten leaders. She also appreciates creative opportunities to develop curriculum while working within the standards framework. In addition to her creativity, parents appreciate the positive relationships she fosters with students. “She is incredibly energetic, loving and supportive to the kids,” wrote one nominator. One of Logan’s many strengths is her ability to relate to her students. She attributes her rapport to her commitment to being a good listener. Logan also enjoys working with her colleagues at Kings Beach Elementary and says it is a pleasure to be there. “Every single one of my co-workers I can count on as a friend and every single teacher works so hard and wants the best for the students,” said Logan. Just as Mrs. Williamson did for her, Logan tries to guide her older students when they seek advice about new teachers and being outside their comfort zone. To nominate your teacher for the Truckee Hometown SEARS-Sierra Sun/Bonanza Teacher of the Year award email tahoetruckeeteacheroftheyear@gmail.com or take nominations to the Truckee Hometown SEARS store 12047 Donner Pass Road.